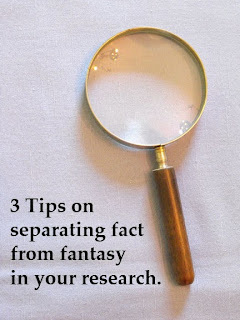 Whether they write fiction or nonfiction, most writers I know do research. Almost as many believe that if they find a fact three times they can trust that it’s true. Unfortunately, that’s nothing but myth. You can find a piece of misinformation just as many times as you can find an accurate fact. The reasons for this vary. Once something is published and in circulation, other people can cite it. That’s fine if it is accurate, but if it isn’t, you now have the same inaccurate information published in multiple places. It can also happen if the information is being published to push a certain agenda. The end result is sometimes more important than the accuracy of the information. Group the facts. After you’ve done some reading on your topic, you are going to see certain bits of information repeated again and again. You will also begin to notice schools of thought – Group X has gathered facts that prove global warming while Group Y has just as many facts that debunk it. As you read material from each school of thought, consider how their biases will shape which “facts” they choose to present and which they ignore completely. Go to the top. Some schools of thought are easy to dismiss. Now that we’ve seen the Earth from space, we can dismiss Flat Earth supporters. But what about your topic? It may not be as obvious. Look for an expert who isn’t a strong supporter of either school of thought or at the very least questions both. Reading what this person has written may be enough to help you separate fact from fiction. If not, ask for an interview. Read and research even more. Have you reached the point in your research that everything you read duplicates something you’ve already read? If the answer is no, keep reading. Once you’ve read to this point, you’ll be surprised how obvious these bits of misinformation are and you’ll wonder why you didn’t spot them sooner. 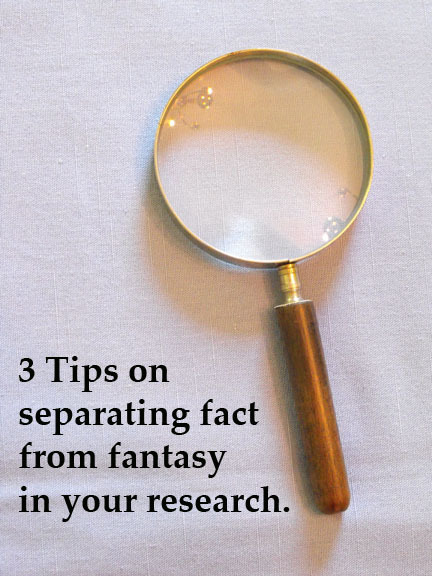 No matter what you write, you need to know how to separate fact and fiction as you research. SueBE--For writers like me--who usually write memoir pieces--it's always good to get some pointers about doing research. Great post Sue - thanks for sharing! I think this is very helpful for writers at any stage in the game. Hi Sue, I really loved your post. I struggle every time I research to separate the real facts from the fluff and the bias. After reading this, I have a clearer idea of how to do it. Thanks! Hi Sue-- thanks for the tips. I love to research and can get lost in it. This helps me sort it out a bit better! I'm glad you all found this post helpful. I've been thinking about the topic a lot lately as I'm writing a picture book on prayer. Because I am researching religion, bias is a huge issue. That said, research is always fun -- like putting together a jig saw. Sue, this is wonderful advice. It's amazing how facts -- even inaccurate ones -- grow legs and keep on moving. Reading around a subject definitely helps.